Benefited by the excitement of the format, the 2017 Funko Coco Mystery Minis figures help unravel a few secrets within the Rivera family. Most subjects from the Pixar film are vibrantly colored in their miniature form. Adding more collecting variety, only a handful of figures resemble their Pop! Coco counterparts. Among these are Miguel with face paint, and Ernesto. The skeletal Hector figure is similar to the Pop! except that his mini stands with a guitar. There is also an option for Miguel without a painted face, and holding a guitar, that, coincidentally, matches Ernesto, his great-great-grandfather. In addition, Fans of Coco will find Imelda, Miguel's great-great-grandmother, and Dante the dog, who is wearing a brightly colored Lucha Libre costume (with wings)! Compared to most MM releases, Funko Coco Mystery Minis is relatively small with the main set having just eight choices. However, there are at least three Toys R Us exclusives, which are glow-in-the-dark variants, for Ernesto, Imelda and Miguel. A staple of the brand, every figure is issued in a blind-box format to help keep the contents disguised until they are unwrapped. Even though there are at least eleven figures, fans may need more than one case to collect the entire set, depending on the final odds. Known individual box odds for the Funko Coco Mystery Minis figures are noted below. 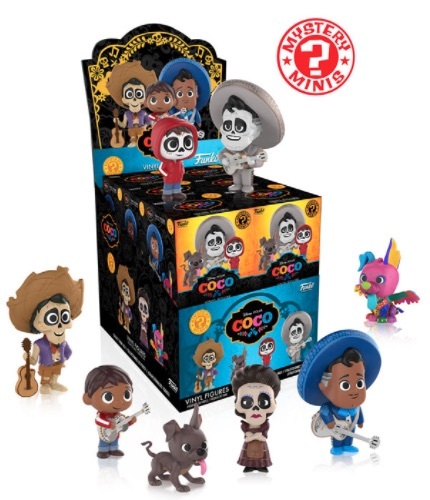 Order Funko Coco Mystery Minis Boxes on Entertainment Earth.